The Ocalla Tramway: A Mock-Up Cab for the Ocalla Shay! Well progress has slowed quite a bit recently on the shay. My quick "patch job" on the crank shaft assembly fell apart and now is utterly useless... I was fortunate enough to find another shay kit to salvage parts from and hopefully I won't mess things up the next go-round. I'm also going to contact WMS to see if I can get a better 2-Cylinder casting and some other details for the shay. In the mean time I started working on the "Spud", my little 0-4-0T mining Porter, but more on that in a future post. However today I decided to start working, or rather planning, the cab of my Shay locomotive. I drew out the cab in scale on 1/4" graph paper, but done in a way that would allow the cab to be cut out and folded into a mock-up pattern. Once the drawings were done I made a copy of the drawings on heavy printer paper and then colored the drawings by hand with markers. Once the paper was dry I carefully cut out the drawings and then scored certain edges to help when folding the mock-up. It has surprised me how similar this project is turning out to look like my original concept I drew a few years ago when I first conceived this project! 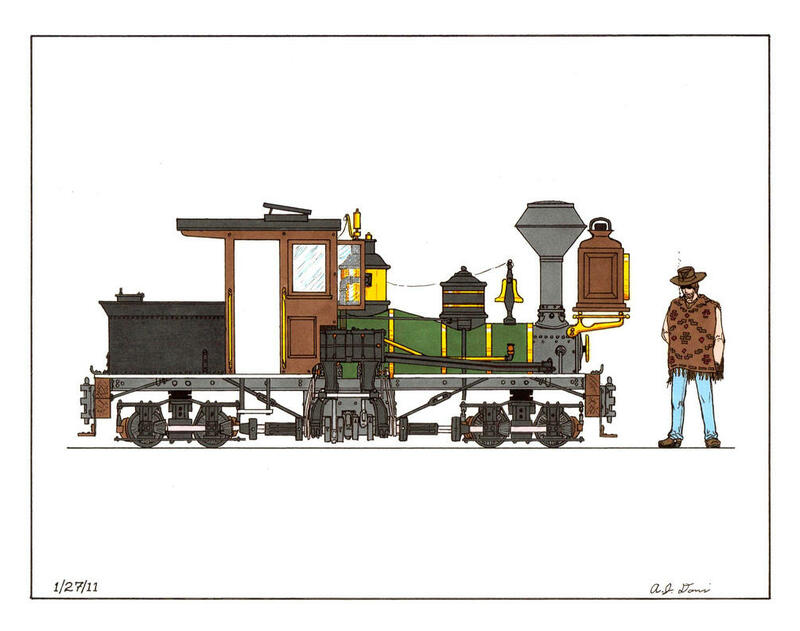 Here is a side view of the locomotive as it looks presently and there drawing will be below it for comparison. The resemblance is pretty uncanny for a drawing not done to scale, wouldn't you agree? Also as a note I've decided to forego the use of the supplied tender tank(s) from the MDC kit and I'll be using an AHM/Rivarossi Old Time 4-4-0 tender shell for the tank. It's shorter in height than I'd like and not as wide, but I think it will work perfectly for the look I'm going for and it saves me from having to fabricate my own tender flare. Not to sound lazy or anything. Anyway, thanks for dropping by and stay tuned. As always there will be more to come! Thanks for watching!